Combine the olive oil, rosemary, thyme and crushed red pepper, if using, in a heavy small skillet over medium-low heat. Cook until the mixture is fragrant, about 5 minutes. Remove from the heat. Place the pecans in a small baking pan and roast until toasted, about 7 minutes. Set aside. Combine the vegetable oil and 3 popcorn kernels in a heavy 4 quart saucepan or large pot. Cover and cook over medium heat until 2 or 3 kernels pop, about 5 minutes. Add the remaining corn kernels. Cover and cook until the popping stops, shaking the pan frequently, about 5 minutes. Remove the pan from the heat. 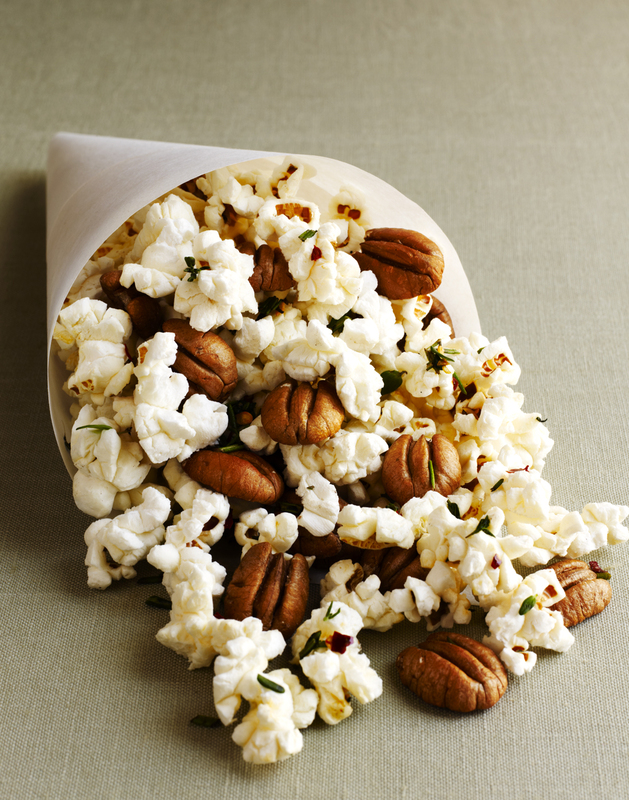 Add the pecans and olive oil mixture and stir until the popcorn and pecans are coated with the oil mixture. Season to taste with salt and pepper. Transfer the mixture to a large bowl and serve right away as a snack. Nutrition Profile: 230 calories, 21 g total fat, 2 g saturated fat, 0 mg cholesterol, 0 mg sodium, 9 g carbohydrates, 3 g fiber, 3 g protein.